Click HERE to read "Finishing Touches for Statement Making Kitchens," a recent blog post by the The Northern New Jersey Scout Guide. Butler's of Far Hills was scouted for Jeff's unique incorporation of subtle details that give warmth and balance to this cool white Nantucket kitchen. The modern polished chrome pendants, Carrera marble countertops, and grey and white mosaic backsplash are complimented by the bamboo shades, the dark wood floors and the caned back counter stools with bamboo detailing. 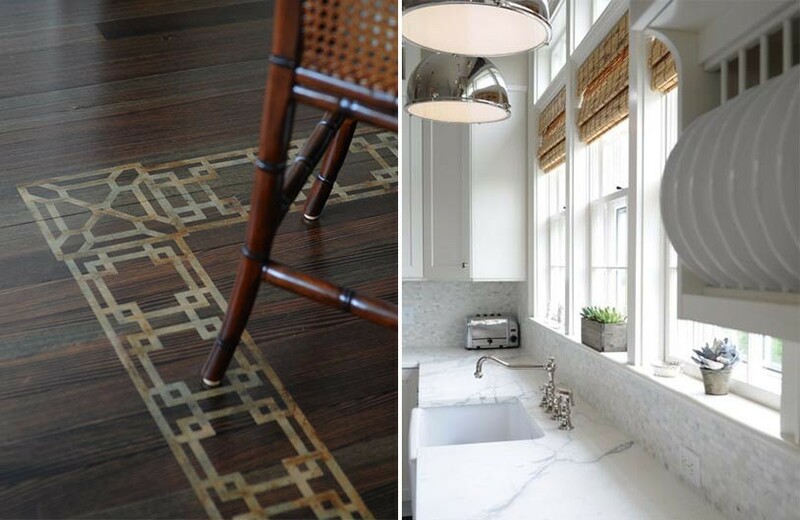 Greek key inspired hand stenciling on the floors frame the center island and add an exquisite finishing touch to this magnificent kitchen. Click HERE to view more of the featured kitchen and other coastal kitchens in Jeff's design portfolio.